The Philippines’ most-awarded broadcast journalist, Jessica Soho, continues to be a loyal Kapuso as she renews her commitment with GMA Network in a contract signing held on March 13. 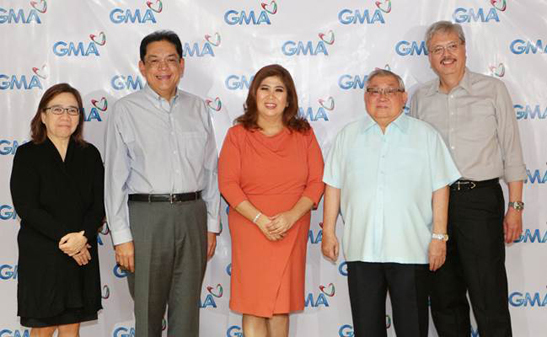 From left: GMA Network SVP for News and Public Affairs Marissa L. Flores, President and COO Gilberto R. Duavit, Jr., GMA News Pillar Jessica Soho, GMA Chairman, and CEO Felipe L. Gozon, and EVP and CFO Felipe S. Yalong. Present during the signing were GMA Network bigwigs including Chairman and Chief Executive Officer Atty. Felipe L. Gozon, President and Chief Operating Officer Gilberto R. Duavit, Jr., Executive Vice President and Chief Financial Officer Felipe S. Yalong, and SVP for News and Public Affairs Marissa L. Flores. “Thirty-fours years na po akong Kapuso,” shared Soho, who started her career as a news reporter covering the military and defense beats. The self-confessed “promdi, or a small town girl, who made good” has only gratitude towards the people around her for success. “I would like to express my gratitude to all the people I have worked with and to the people behind GMANetwork. At of course, to the viewers that continuously follow our stories on TV, maraming salamat po sa inyong pagtitiwala,” she added. Meanwhile, Atty. Gozon is also elated that Soho remains a Kapuso. “We are glad because her program (KMJS) is the number one show in the station. It always wins in the ratings game and tramples its competition. Ganun kahalaga si Jessica sa GMA kaya talagang galak na galak kami na ipagpapatuloy natin ang kanyang more than 34 years dito sa GMA,” he said. Mr. Yalong, cited how Soho was very easy to talk with in terms of renewing her contract with GMA. “She knows how the network values her contribution especially yung programa niyang KMJS na nangunguna nga,” he said. At present, Soho anchors GMA News TV’s flagship newscast State of the Nation with Jessica Soho (SONA). She also hosts the country’s top-rating and trending program Kapuso Mo, Jessica Soho (KMJS) on GMA-7, and is the chief correspondent/ host of the investigative news magazine program Brigada on GMA News TV. A two-time recipient of the highly prestigious George Foster Peabody Award, Soho was recently named as one of the members of this year’s New York Festivals Television & Film Awards’ Grand Jury. In 2018, she brought another honor to the country as the very first Filipino news anchor to become a finalist at the said international competition, taking home the Bronze Medal in the Best News Anchor category for State of the Nation with Jessica Soho (SONA). This year, the “Salay” feature in KMJS is nominated in the Community Portraits category at the 2019 New York Festivals “World’s Best TV and Films” Competition. At the 2018 Reader’s Digest Trusted Brand Awards, Soho was named the first ever Hall of Fame Awardee for winning the Most Trusted News Presenter award for eight consecutive years. She remains the Filipino journalist with the most number of Reader’s Digest awards to date. Soho is also the first UP College of Mass Communication alumna to receive the Gawad Plaridel Award for Journalism from the University of the Philippines. At the HISTORY CON 2018, she was given the History Maker Award for her significant contribution to the nation’s life and culture.